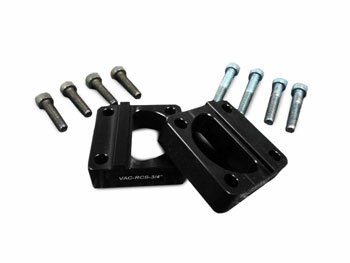 Our latest style E30 M3 Roll Center / Bump-steer Spacers, machined 6061 T6-aluminum with superior grade 12.9 hardware. What do these offer your M3? In the simplest terms; when you aggressively lower your E30 M3, your suspension is quickly moved out of it's ideal geometry. As well, the relationship between the streering tie rod and control arm move out of harmony. Our bolt-on spacers help to re-align the original lower control arm orientation for improved cornering grip, and help if you are experiencing bump steer or a vague feel when counter steering. With our design, the thick billet construction takes the shearing load and alleviates pressure applied to the hardware. Several hundred sets of these have been sold over the years, with customer race, rally and street experiencing improvements. These RCAs will stand up to the abuse you dish out, while improving feel. A highly recommended upgrade for lowered street and track vehicles. Especially those with Race springs or Coilovers. From Ric of Lakeland, Florida on 1/11/2010 . From Anonymous of LaPine, Oregon on 4/7/2009 .